Posted January 23rd, 2012 by Yvonne Hawkey & filed under Uncategorised. We’re having a party, come and join us ! 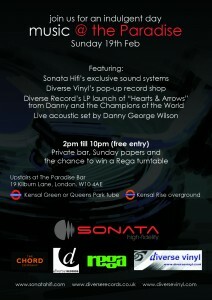 Sonata, along with our good friends at Rega, Chord Co and Diverse Vinyl will be putting on an indulgent day of great music. A private bar, Sunday papers, a pop-up record shop and a free raffle plus a superb sound system. What more could you want ?…. Oh yes, free entry of course.